Nowadays, it is a popular resort with many sanatoriums and sites committed to health improvement. The town owes its rejuvenating qualities to the chalk mountains, which protect the town from winds, and to the pine forest, which fills the air with the healing aroma of evergreen trees. The town’s unique microclimate has a favorable influence on one’s metabolism, improves the immune system, and helps resist against airborne diseases. 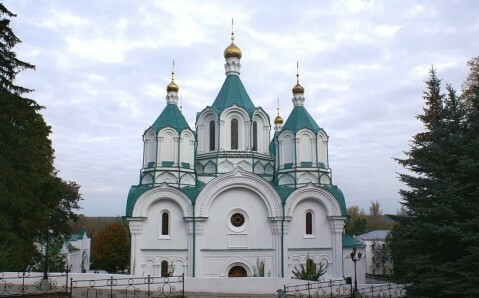 But well outside Ukraine, Sviatohirsk is famous, first and foremost, for its Lavra of the Holy Dormition – the main Orthodox shrine of the country’s eastern region. 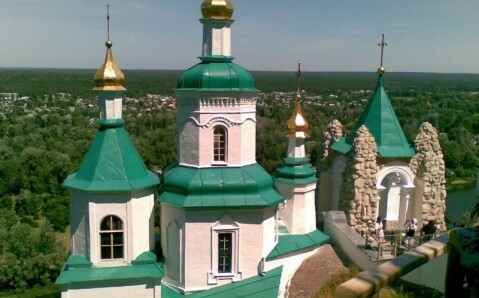 The first monks appeared here in the 15th century and founded a temple in the caves of the Donets River’s high bank. For several centuries, the temple, and the monks’ cells around it, attracted clerics and pilgrims from different corners of the country; the Sviatohirsk cloister grew and prospered. But in 1787, the Empress Catherine the Great ordered to close the temple and to disperse its monks. The temple’s wealth was passed to the Russian treasury, and Sviatohirsk’s rich territory was given by the empress to her favorite general, Gregory Potemkin. On one of the mountains, the general built a palace; on the shore of a picturesque lake – bathing houses for guests. The monks’ temple reopened in 1844, but not for long. In 1922, with the rise of the Soviets, the monastery was closed more, and almost destroyed. 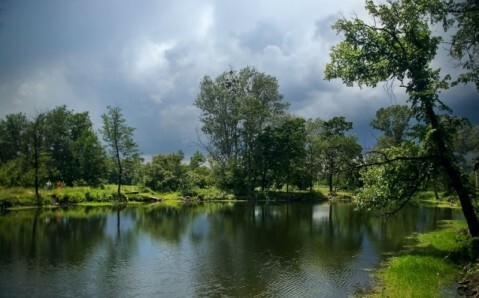 On its territory opened a holiday center for workers of the Donets Basin. And only after the collapse of the Soviet Union did the cloister, restored from ruin, open its doors to monks once again. In 2004, it gained the status of being a lavra. 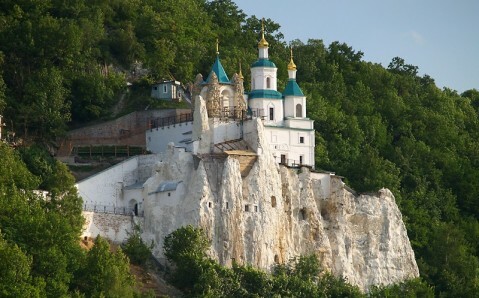 Today, the Lavra of the Holy Dormition, rising majestically on a picturesque chalk mountain, attracts not only worshippers, but tourists, as well. Its brightest gem is the marvelous Dormition Cathedral, whose architecture absorbed aspects of the Byzantine and the traditional Russian styles. Not far from the monastery is its most ancient part: the Sviatohirsk cloister, where monks’ caves and the underground temple are open to visitors. 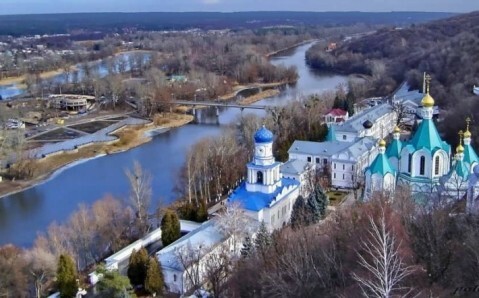 The Lavra of the Holy Dormition is located on the territory of the "Holy Mountains" park, where unique archeological, cultural and historic landmarks are located. 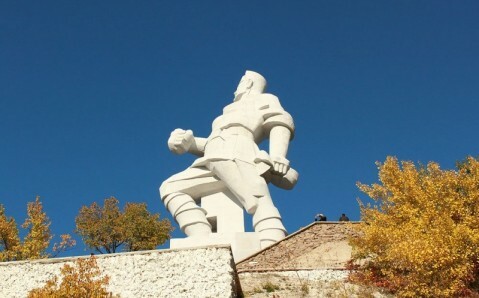 The 22 meter (72 foot) high Monument to the Soviet Revolutionary Artem takes a special place among them. The famous sculptor Ivan Kavaleridze created this huge cubist sculpture, which blends well with the monastic complex. To get there: Sviatohirsk is connected to Donetsk and other large cities in the region by route taxis and buses (2,5 hours, 40 UAH). There is also a direct railway connection with Kyiv, Kharkiv, Lugansk, Donetsk, and Simferopol.